After Toyota decided saying sayonara to sport cars like the Toyota Supra, mid-engine Toyota MR-2 and 2005 even to the Toyota Celica, nobody got the Japanese manufacturer on the sports cars list anymore. After announcing and showcasing the Toyota FT-86 concept car at the Tokyo Motor Show 2005 a lot of JDM fans was stoked. Only two years later the Toyota 86 launched at his domestic market in Japan and the 2+2 sports car with it’s 200 hp boxer engine and rear wheel drive conquests with different names (Toyota 86, Toyota FT86, Toyota GT86 and Scion FR-S) the hearts of JDM fans. It doesn’t matter if you build a Clubsport Racer for the Nürburgring Nordschleife, a radical time-attack race car like Evasive Motorsports in the video above or you are building an awesome stance movement car with a bodykit from TRA Kyoto Rocket Bunny. The whole tuning scene seems to waited for an old school car like the Toyota GT86. Remember it got “only” a naturally aspirated boxer engine a 2.0 liter engine displacement! Also in Poland the JDM fans loves the Toyota GT86 and the KW suspensions dealer JDL Performance modified the GT86 of their customer Mario in “Polish Dynamite”. 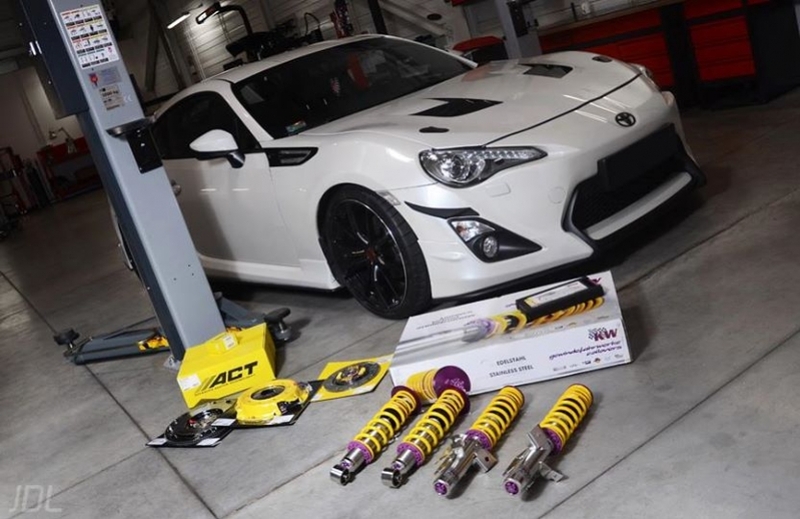 Like so many GT86 fans also Mario trust in our well known KW coilover kit Variant 3. 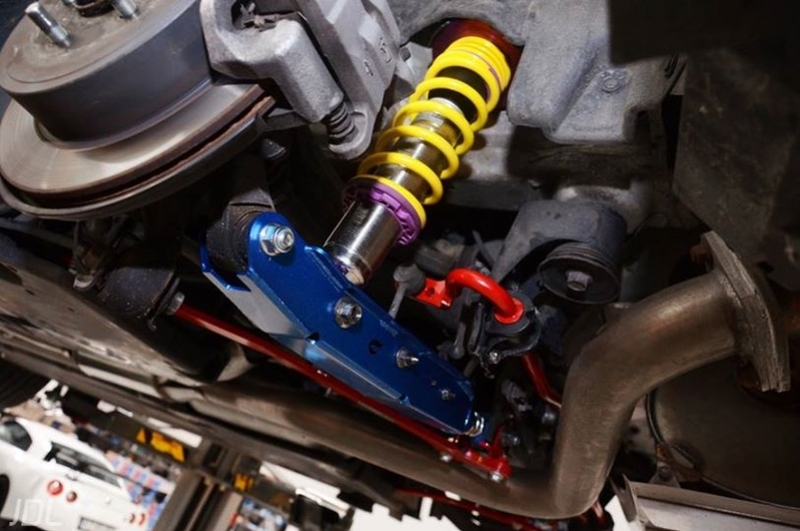 Made of stainless steel and independently adjustable in rebound and compression forces the KW V3 gives your car far more as only an adjustable ride height for the maximum stance. Even the Evasive Motorsports FR-S or the Pikes Peak International Hill Climb Mackin Industries FR-S using a KW suspension kit with adjustable damper forces. Mario also equipped his Toyota with a Cusco rear control arm. For the HLS installment we equip the KW struts with a hydraulic lifting cylinder, installing a hydraulic compressor and steel flex lines and after pushing the HLS button Mario’s GT86 lifts on both axles about 45 millimeters. Mario modified his European Toyota GT86 with the optional GT86 Aerobody and a lot of more parts. 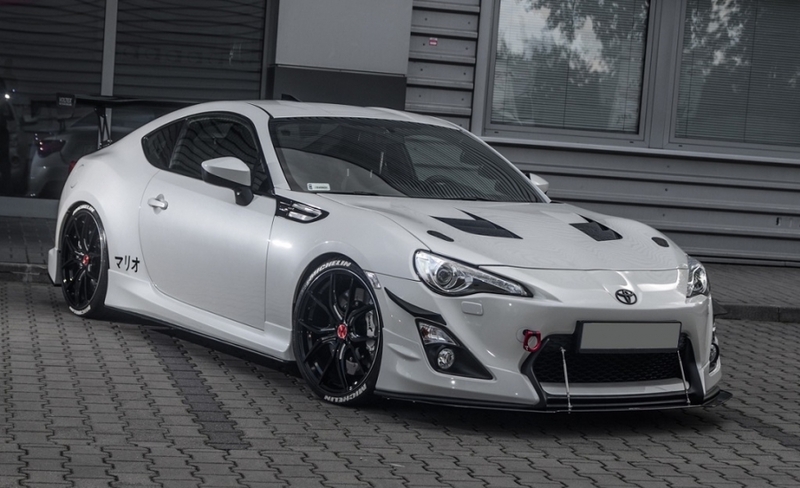 Fans of the GT86 will recognize the Seibon hood, the APR spoiler lip and the beautiful 19″ Rays Wheels (Design 57FXX). And the APR spoiler lip is not a part you want losing at a speed bump or at your garage driveway. But Mario’s Toyota got much more to show. At the rear you see a mighty Voltex GT V2 wing, Velox diffusor and a stainless steel exhaust. Soon the Pole want to do much more with his Toyota. At the moment he already installed a Avo Turbo Kit for a new engine performance about 330 hp. But now he will also install a Cosworth compressor too! With the turbo and the compressor I guess I will have 450 hp, he said. More horsepower is always a good investment. By the way on Facebook www.facebook.com/Projekt86byMario you can check the latest news about Mario’s Toyota GT86!